Frankly, requests to rent computers are few and far between. There is no way we are going to spend big bucks on state of the art devices in a tiny market like Key West and tie up that sort of money. However, if misfortune befalls you, we have a high-quality older laptop and 2 netbooks that will handle most tasks one might need to take care of while in Key West, especially in an emergency and with a range of pricing. Full Size Laptop. (Black) 15.6 Inch HD Screen, 1366 x 768 Resolution, 64 Bit Windows 8.1, HDMI, Wifi & Bluetooth, CPU AMD A4 Quad Core 1.8 Ghz, 8 Gigabytes memory. 500 GIG Hardrive, DVD Drive, SD Card Slot, RJ45 Ethernet Network, Stereo Sound with mic, speakers and line. Built-in HD Webcam, Battery Life 4 hours approx. Includes AC adapter. 5.3 lbs. Computer has TelePrompter software, VLC Media Player, Microsoft Office 2013, Microsoft Power Point Viewer, Microsoft Photo Story 3, Audacity Sound Editing, Levelator, Apple Quicktime, RealPlayer, Full Open Office, DJ DMX Lighting Control (with dongle upon request) plus all the software that normally comes with this computer. Rental: $45 per 24 Hours. $115.00 per week. with Intel Atom 1.6GHz CPU, 2 GB Memory, Bluetooth and WiFi, 32 Bit Windows 7 Starter, 7 Hour Battery Time, 281 GB HD (228 GB Free), Webcam, Ethernet and SD Card Slot. 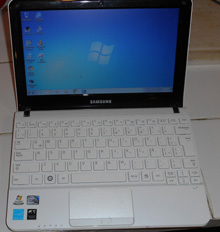 Software includes Microsoft Office 2010, Open Office, Power Point Viewer, VLC Media Player, Skype, etc. Includes AC Adapter. Rental: $35 per 24 Hours. $85.00 per week. External standard and widescreen monitors available for netbooks. Additional $10.00 daily or $25.00 per week. Approximately 4 hours on battery. AC Adapter included with rental. Intel N270 1.6 Gigahertz Atom processor, XP Home Edition OS, 160 Gig hard drive (126 Gigs Free), 1 GIG of Ram, 1.3 Megapixel webcam, SD Memory card slot plus additional multi-type memory card slot, 3 USB connectors, printer port and VGA video out port, WifFi built-in, 3G SIM card slot is usable but 3G access is not included. 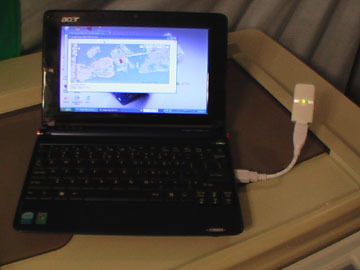 If requested, includes GPS dongle and computer has commercial Google mapping software to use the computer as a full fledged GPS system. Office software includes Microsoft Works, Microsoft Office 2007, and assorted other software. Includes AC Adapter. Rental: $25 per 24 Hours. $65.00 per week. 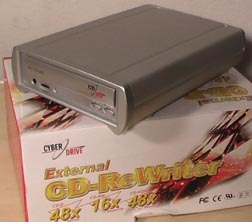 CyberDrive Technology, External CD Burner, Silver metal case. USB cable. External DC power supply. Rental: $18 per 24 Hours. For example, this would be great for photo opportunties with a famous person. A note and/or signature could be added to the picture right before it is printed from the camera memory card. This is a very high quality photo printer. 24 Hr. Rental $65.00 includes 6 prints. Home Page Copyright © 2019 by TVkeywest.com, a Service of Blue Planet Offices, Inc. All Rights Reserved.